Tuesday December 28th 1926 I knit on bead bag in AM. Had letter from Winnie and wrote to her. I went down town by street car was at Hedges, Mrs Rhinds, Will & Elmer Andersons. came down town by car in time to ride home with Rob. 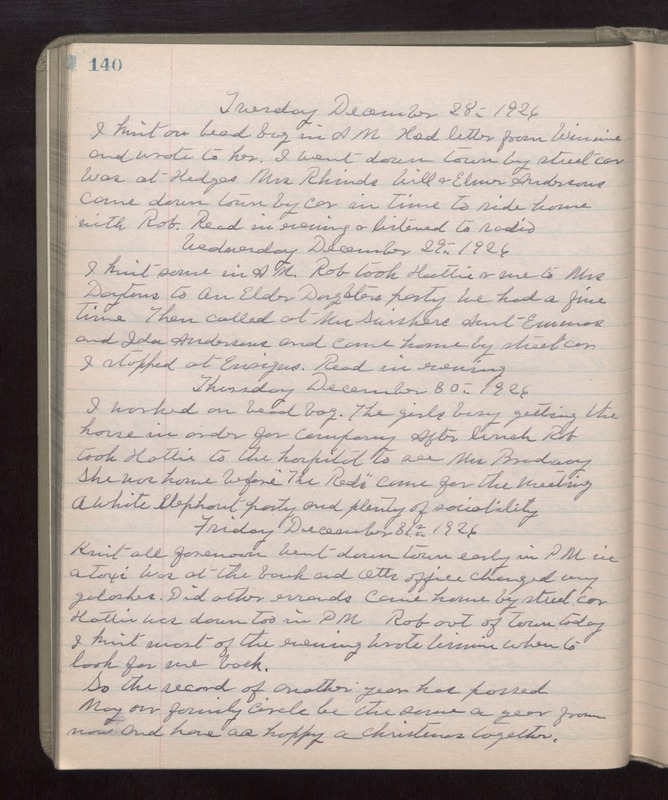 Read in evening & listened to radio Wednesday December 29th 1926 I knit some in the AM. Rom took Hattie & me to Mrs Daytons to an Elder Daughters party. We had a fine time. Then called at Mrs Swishers, Aunt Emmas, and Ida Andersons and came home by street car. I stopped at Ensigns. Read in evening. Thursday December 30th 1926 I worked on bead bag. The girls busy getting the house in order for company. After lunch Rob took Hattie to the hospital to see Mrs Bradway. She was home before "The Reds" came for the meeting A White Elephant party and plenty of sociability. Friday December 31st 1926 Knit all forenoon. Went down town early in PM in a taxi. Was at the bank and Otts office. Changed my galoshes. Did other errands. Came home by street car. Hattie was down too in PM. Rob out of town today. I knit most of the evening. Wrote Winnie when to look for me back. So the record of another year has passed. May our family circle be the same a year from now and have as happy a Christmas together.